When I was looking for a hotel for my parents to stay at in Beverly Hills, someone on Twitter suggested the Peninsula. I can't remember for the life of me who suggested it, but whoever it was, thanks for a wonderful suggestion. 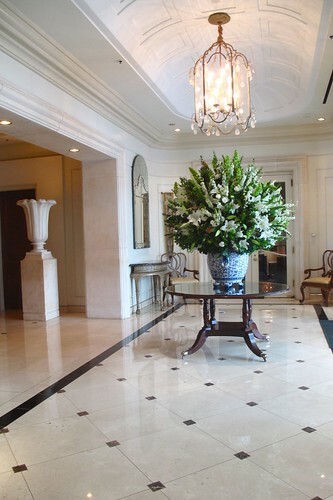 It was exactly the kind of hotel I was looking for--luxurious but not pretentious, quiet and secluded yet still in the heart of Beverly Hills. While there are obviously many 5 star options in Beverly Hills, after extensive research, I found the rate per night at the Peninsula to be the most reasonable. From the complimentary upgrade, to the bowl of impeccably fresh fruit waiting in the fountain-view room, my parents could not have been more satisfied. I stayed one night in the room with my parents, and let's just say, it was a refreshing change from my small, cluttered dorm room. The following morning, my mom woke me up at 7AM. I have not been up at 7AM for a good 3 months. There is a reason why I try my hardest to schedule all my classes after 12PM--I am NOT a morning person. 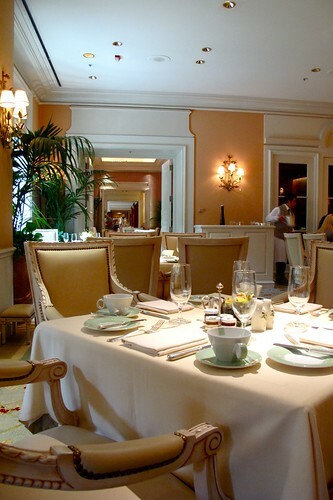 Luckily, breakfast at the hotel restaurant--The Belvedere--was amazing. It was the best non-buffet style hotel breakfast I've ever had. I've only been more impressed by the cereal bar at the Mandarin Oriental in Munich. 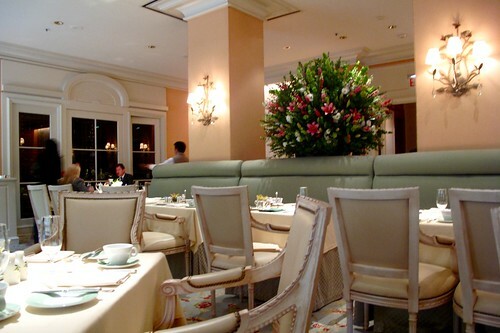 I love the design of the dining room at The Belvedere. It felt very "Beverly Hills" with its taupes, light corals, and muted greens. Upon sitting down, we were offered orange and grapefruit juices or coffee. Of course, like with any hotel breakfast, freshly squeezed orange juice is pricey. Sometimes it's delicious and worth the splurge, and sometimes it's not. We splurged, but the orange juice was fairly average although obviously freshly squeezed. I've always been intrigued by the concept of cutting a hole in a piece of toast and cooking an egg in it, but I've never gotten around to doing it. 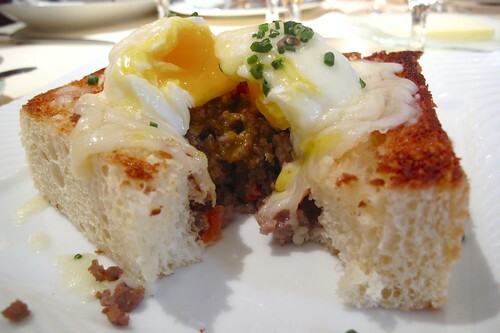 I'm pretty sure the version at The Belvedere isn't your typical egg-in-the-hole. 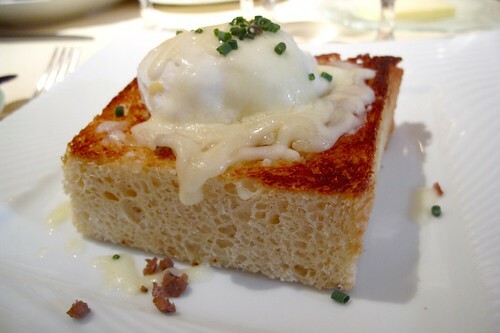 The Belvedere's "Egg in the Hole" was a perfect square of "light" and fluffy house-made brioche filled with juicy turkey sausage and topped with a perfectly poached egg and fontina cheese. For some reason, when I cut through the poached egg and into the buttery brioche, I wasn't expecting turkey sausage at all and it was such a lovely surprise for me. I obviously was not reading the menu (probably because it was only 7AM in the morning!!). However, this egg-in-the-hole is definitely worth waking up in the morning for! 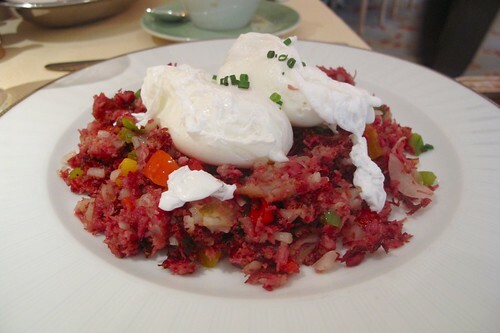 My dad ordered the corned beef hash--no surprise to me or my mom. If corned beef is on the menu, my dad will order it. I managed to steal a bite and found it to be pretty tasty, especially after breaking open the yolk of the poached eggs. 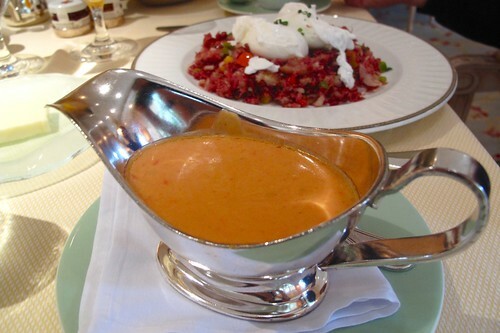 The dish originally came with an interesting tomato hollandaise but my dad ordered it on the side to reduce the richness of the dish. There was a bruléed oatmeal on the menu that looked so interesting to me but 1) I picked my egg-in-the-hole over it and 2) my mom couldn't be convinced to order it because there was maple syrup already mixed into the oatmeal. I didn't try too hard to persuade my mom to order the bruléed oatmeal because well, it's her breakfast and I guess plain, unsweetened oatmeal is healthier. 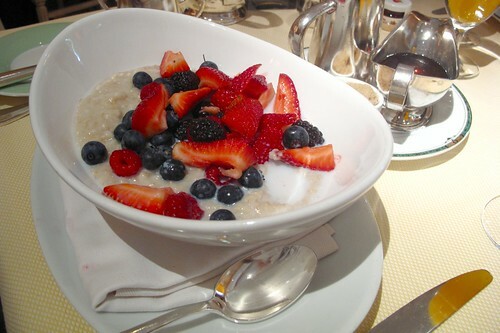 This was a ridiculously large serving of oatmeal though. At least she chose fresh berries over bananas as the topping--which I enjoyed when I attempted to help her finish the monstrous bowl of oatmeal. My husband is like your dad! He is a corned beef hash monster!